Unlike internet e-mail, photos on VeggieConnection.com are not "sent" as attachments. Instead, members upload photos to their photo gallery for others to view. 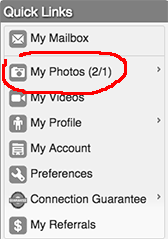 Members with photos have a Photo Gallery button on their profile to display their photos.